Tag art is one of the most popular trends in scrapbooking and one of the easiest embellishments to create with Suzy's Zoo stickers. Below is an example of some of the effects you can achieve with Suzy's Zoo stickers. All four examples use layering (or collage). Three of them also used torn edges for effect. They barely touch the surface of what can be achieved with tags, but hopefully they are enough to inspire you and point you in the right direction. There are many uses for tags in scrapbooking. This layout was discussed in the Borders section, but I wanted to bring it to your attention again to show you how the tag is used as an accent. 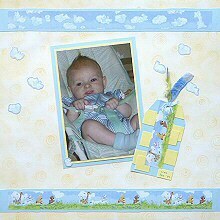 The page uses Suzy's Zoo Baby Borders. One third of one of the borders was used on the tag. The tag was made from blue and yellow cardstock and the Suzy's Zoo sticker was then layered on top. A hole was made in the top and the fibre threaded through. The completed tag was placed in the corner of the photo mat to complement the photo. This is just the beginning! Suzy's Zoo stickers are incredibly versatile and can be combined with a wide range of techniques to create the effects you are looking for. Let your imagination run wild and have some fun with them. Afterall, that's what it's all about!